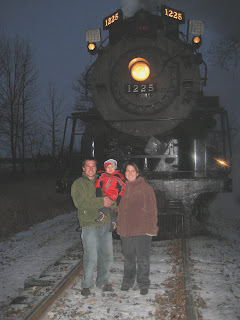 We saw the Polar Express last weekend at the 'North Pole"! NO, I'm not crazy...it only took us about 30 minutes to get there. It was in Chesaning. The actual train that they used to make the movie with was there. It came from Owosso to Chesaning. You can ride the train and have hot chocolate just like in the movie, except it cost a LOT of money to go for a ride. Ty was happy enough just to see it and all the steam that came with it. how fun! 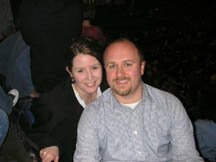 you guys are great parents. i hope we take our little girl for fun trips like that!